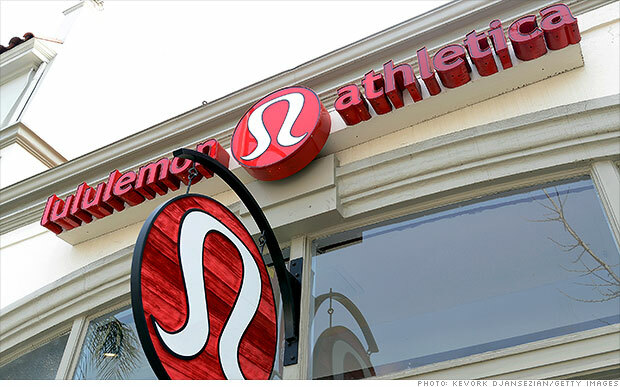 The stock of Lululemon (LULU) is surging despite a bland report today from the new CEO. Same-store sales were negative during the holiday shopping season, something analysts dubbed "once unthinkable". The yoga clothing company also gave a weaker than expected forecast for this quarter and said fourth quarter earnings were $0.75 a share, barely above expectations. But Brian Sozzi, chief equity strategist at Belus Capital Advisors, the one who characterized the same-store sales numbers as "once unthinkable", pointed out two positive things in a note to clients. He says same-store sales could have been worse. More importantly, there are signs the company is starting to make some traction in regaining customers, even despite the harsh weather and the brand's image problems. "This past year we stumbled a few times," said new CEO Laurent Potdevin, speaking publicly for the first time since taking over in January. Potdevin was brought in late last year from Toms shoes to help turn Lululemon around. He even alluded to some past "PR problems" for the company as he answered questions from analysts on the conference call... but "PR disasters" is more like it. In November, Chip Wilson, the company's founder, said in a TV interview, "Frankly, some women's bodies just don't work" for Lululemon's yoga pants. He was reacting to questions about the quality and durability of the company's marquee clothing product, but his words created a social media uproar that eventually led to his decision to step away from his role as chairman of the board. Related: Dumbest moments in business "Lululemon's pants fiasco"
But that was only part of the company's problems last year. In April, Lululemon's chief product officer Sheree Waterson stepped down following the recall of women's black Luon yoga pants for being too sheer when wearers were bending over. Shortly thereafter, CEO Christine Day announced she would leave in June. The recall and the subsequent shuffles at the top sent the stock tumbling, and Wall Street analysts cut earnings estimates for the company. Potdevin said today that the company entered 2014 with humility after reflecting on lessons learned. Investors, while glad to hear that, are also hoping the new CEO is able to mimic some yoga moves by keeping the company financially limber.